The U.S. Mint and U.S. 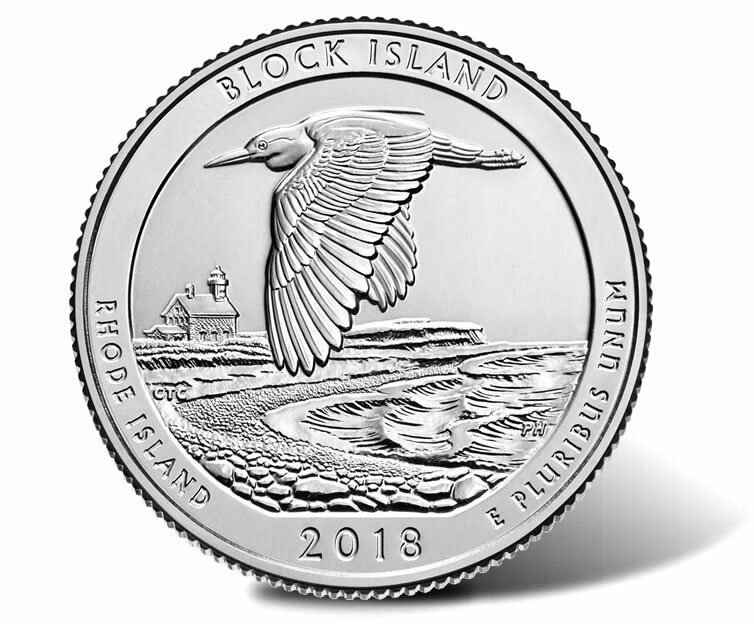 Fish and Wildlife Service will introduce the quarter commemorating Rhode Island’s Block Island National Wildlife Refuge. This year’s final quarter ceremony will take place somewhat near the refuge on Thursday, Nov. 15. Designed by Chris Costello and sculpted by Phebe Hemphill, the Block Island National Wildlife Refuge quarter for Rhode Island depicts a black-crowned night-heron flying over a view from the beach at Cow Cove looking towards Sandy Point. The North Lighthouse is visible in the background. The coin marks the fifth release this year and the forty-fifth in the U.S. Mint’s America the Beautiful Quarter® Program. Two related events support the quarter’s official release. A coin forum hosted by U.S. Mint officials is going to occur on the evening before the ceremony, and then there will be a traditional coin exchange right after the ceremony ends. These events are free and open to all ages. 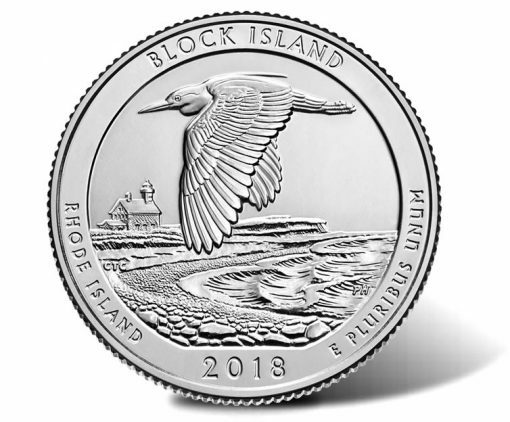 Block Island quarters will enter general circulation on Tuesday, Nov. 13, but it could take many months before they are used in regular commerce, because Federal Reserve Banks distribute coins to financial institutions without regard to their designs. The quarter ceremony is a premium occasion to get this last of five 2018-dated quarters. The U.S. Mint offers another by selling them Nov. 13 in rolls and bags at www. usmint.gov. *Costello designed the reverse (tails side) of the Block Island quarter. Other ceremony participants will include the Chariho High School Student Choir, students from Chariho Middle School, and members of Boy Scout Troop #15. The quarter ceremony’s time and location details follow. Note: Parking for the quarter launch is located at Ninigret Park, Rte. 1A, Park Lane, Charlestown, RI 02813. (GPS Coordinates: 41.374504 -71.665873) Shuttles will be provided from 9:00 am to 10:15 am and following the event. Dress warmly, for it will be an outside tent event. The coin exchange begins immediately after the quarter ceremony. Attendees can line-up to trade cash for $10 rolls of the new coins. A one-roll ($10) minimum and a 10-roll ($100) maximum is common. As mentioned earlier, the United States Mint will also host a coin collector forum on the evening before the ceremony. This free event gives the public an opportunity to learn more about the U.S. Mint’s responsibilities and to ask questions about its products. Coin forums tend to last an hour or so. On Tuesday, Nov. 13, starting at noon ET, the U.S. Mint will begin selling Block Island quarters to the public. Product options include 40-coin rolls, 2-roll sets, 3-roll sets, and 100-coin bags at prices ranging from $18.95 to $46.95. They will be available for order online at catalog.usmint.gov. These product releases will also be covered here on CoinNews. Earlier this year, on Jan. 23, the U.S. Mint released collector proof versions of all five 2018 quarters for $15.95. These coins exhibit frosted designs and mirror-like backgrounds. Proof editions in silver launched on Feb. 22 for $33.95. On March 29, the U.S. Mint issued an uncirculated set of 2018 quarters for $12.95. A set of 10 circulating quarters debuted on October 10 for $8.95.